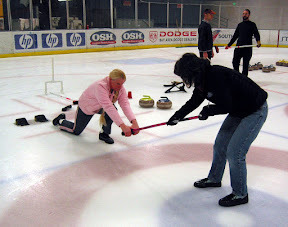 Top teachers produce top curlers - so the SFBACC makes instructor training a priority. Approximately one third of our members have USCA Level 1 instructor certification and several have Level 2 or higher. People who have taken these courses have said that not only did it boost their confidence as a teacher, it also improved their own game. Club member and high-level instructor, Jerome Larson, leads a Level 1 training class in March, 2008. The SFBACC offers Level 1 and 2 classes - usually at least once a year. Classes are typically four hours long with 2 hours off-ice and 2 hours on-ice. Pam B. and Trish H. rehearse a new delivery technique drill during a Level 1 training class. For times and dates of upcoming classes, check our calendar and events list. For more information or to sign up for classes, contact President@bayareacurling.com.